Session 6 – April 30, 2018 – UofU Osher – Earth Science Outside. NOTE: Certainty is a problem. We will meet at one of two pavilions of Sugar House Park: either at Sego Lily Pavilion or Mt Olympus pavilion. Why the uncertainty? Another group may have reserved the pavilion! We’ve always been able to be at one or the other early in the afternoon. Watch for the white Honda pick-up with Earth Science Education insignia. 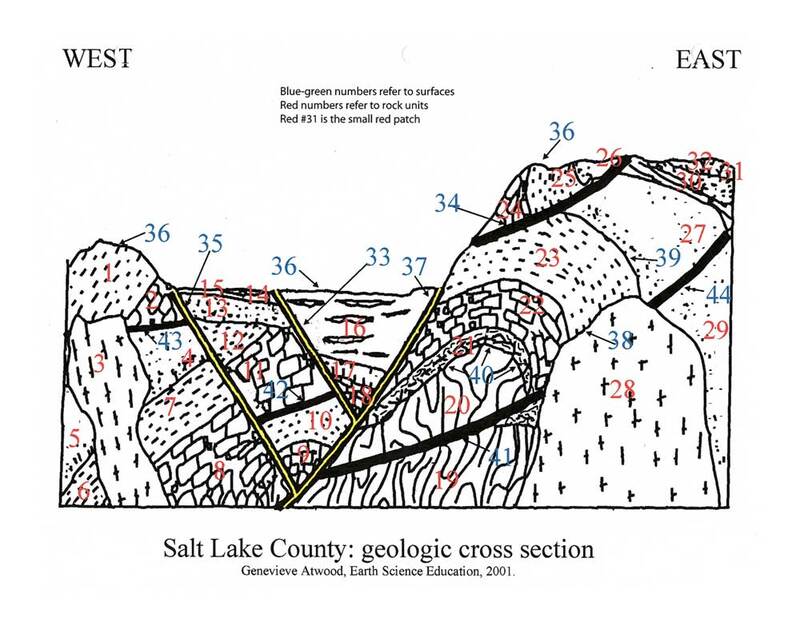 IMPORTANT this time… more that ever… BRING: your handout from Session 1 (Commander’s House) of the Geologic History of Salt Lake County shown as nine cross-sections. WEATHER: The pavilions provide some shelter. If it rains, we’ve made arrangements to retreat to a nearby restaurant. Looks like COLD weather but Okay..
Part 1: Practice the four steps toward Landscape Literacy. We’ll be on our feet for this part, about 15 minutes. Part 2, We’ll work at picnic tables of the pavilion. 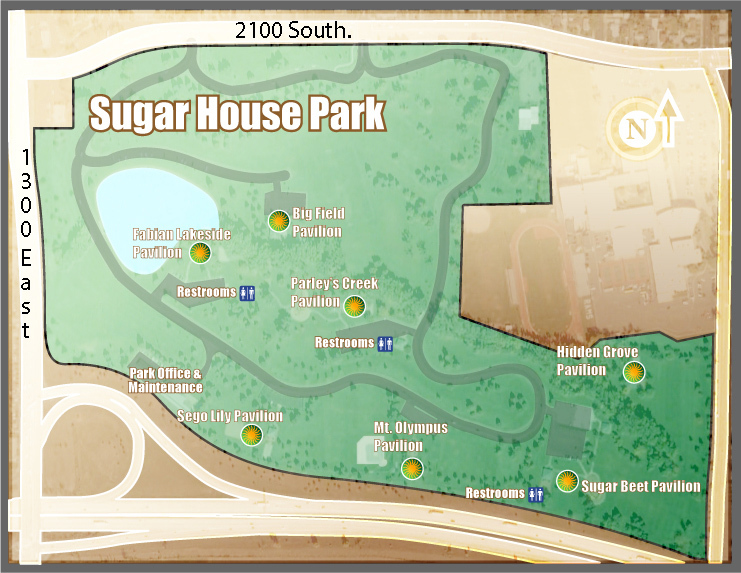 Map of Sugar House Park (2700 So Wasatch Boulevard). Enter the park from 2100 East. We’ll meet at the pavilion parking lot. If it is raining we’ll regroup nearby. Grandeur Peak – AWolcott, 2018. Step two: Look deliberately at patterns of shapes of landforms. PATTERNS… Deliberate awareness of landform shapes and consequences. 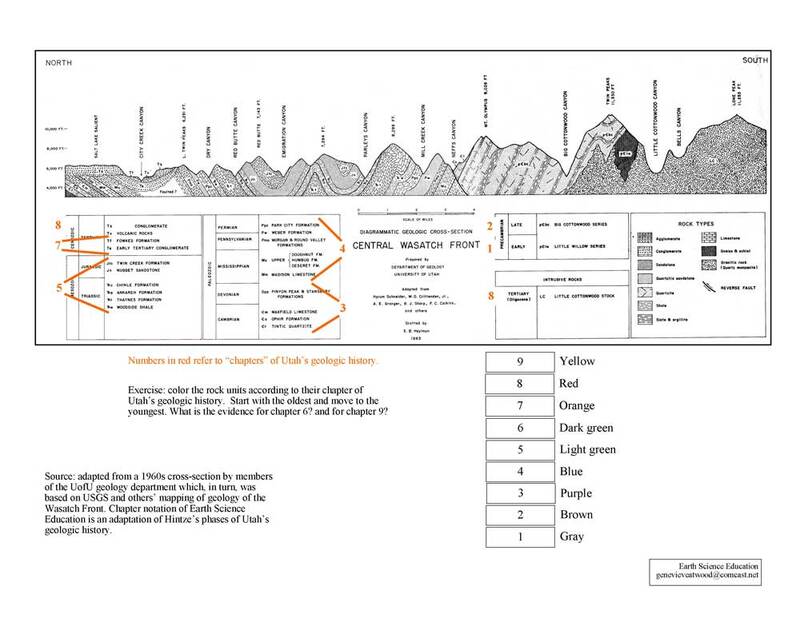 1:45 PM — Cross-section of the Wasatch Front by UofU geologists, c. 1960s. 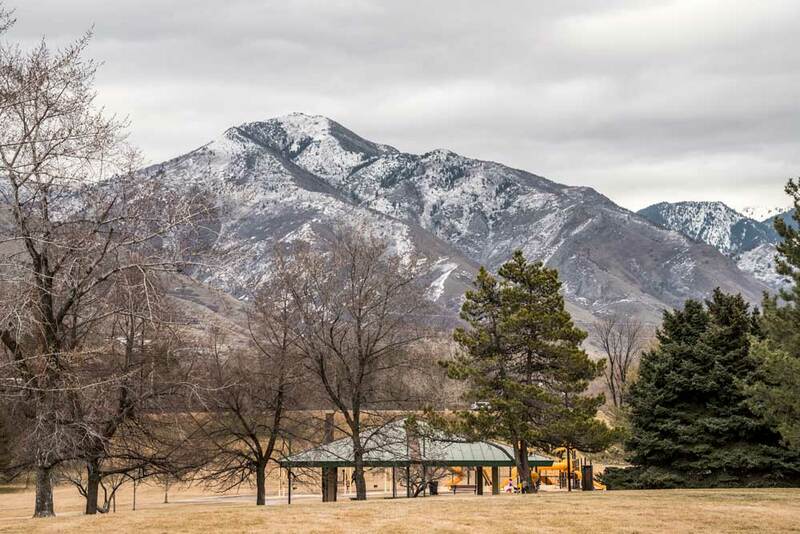 Recognize prominent features of the Wasatch Front in Salt Lake County. 2 PM — Color the cross-section. NOTE: Colored pencils and handout provided. Don’t rush! Color the rock units of the panorama oldest to youngest, using Dr Hintze’s terminology of chapters of Utah’s geologic past. Don’t rush! As you color, look at the scenery. Relate the diagram to the scenery, and scenery to the diagram. List a few types of cross-cutting relationships. Look for evidence of superposition. 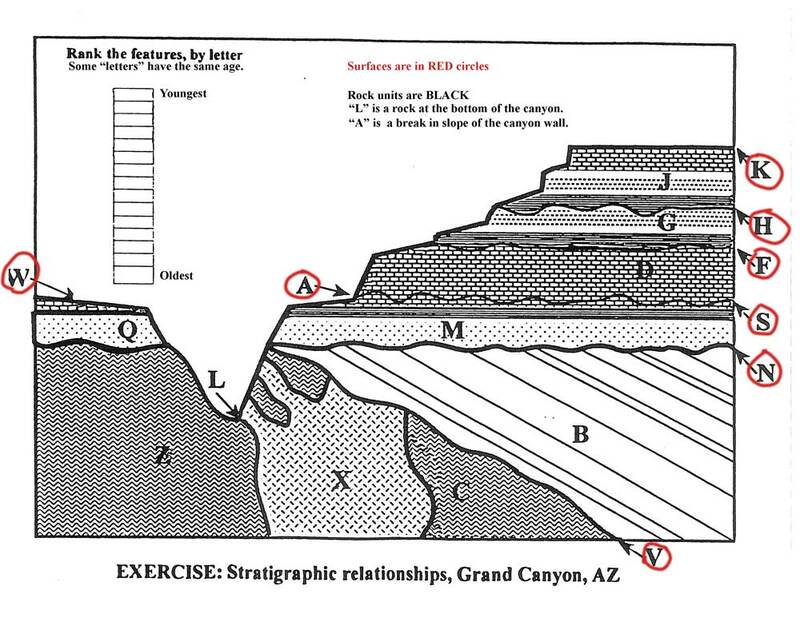 Work out a couple relationships on the cross-section, based on the diagram and your colors for chapters, when did the tilting of rock units happen (which chapter). Participants should relish Step 1 of Landscape Literacy: PATTERNS. Mindful moments. 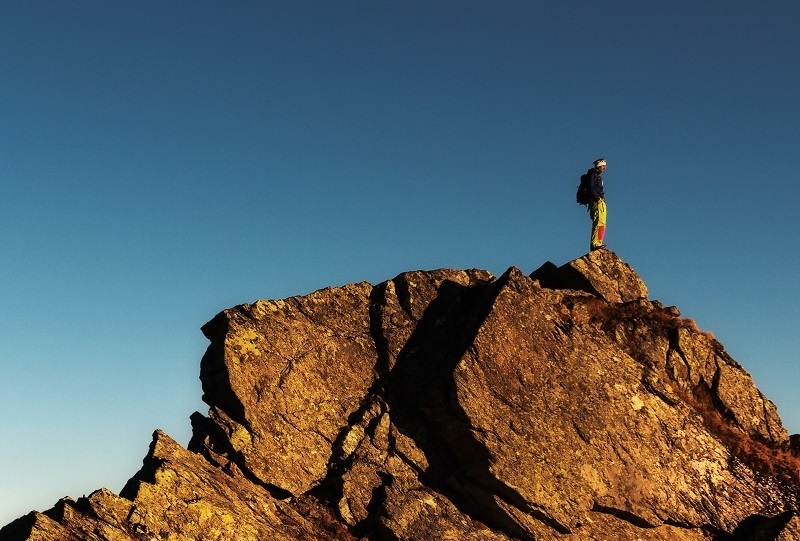 Participants should be able to practice Step 2: Deliberate awareness of PATTERNS of shapes of landforms and interconnections to the five subsystems of Earth systems (geosphere, hydrospere, atmosphere, biosphere, and anthrosphere). Participants should recognize some of the patterns from Faultline Park… and some not. 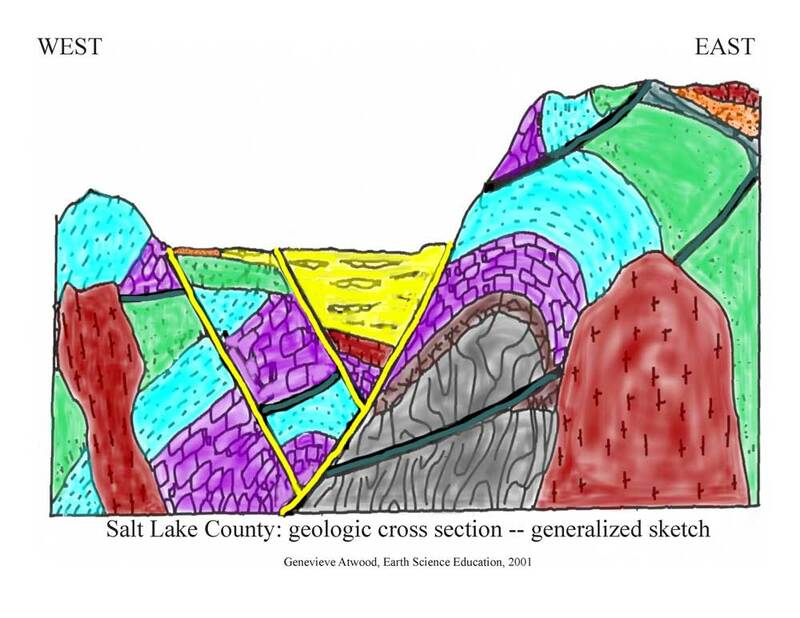 Participants should appreciate the importance of tectonics to Utah’s landscapes. Tectonic forces largely set the stage for regions by changing what is high and what is low. Then agents of erosion / deposition modify the scene. Participants should be able to recognize (pretty obvious) patterns of layered bedrock, specifically, layering and tilting of units. All sediments came from bedrock. 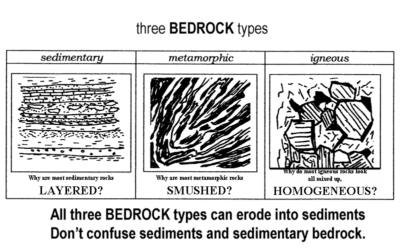 There are three types of bedrock: sedimentary bedrock, metamorphic bedrock, and igneous bedrock. When a geologist hands you a rock, they hand you a piece of sediment that once was bedrock. When a geologist asks a buddy, “what kind of rock is this?” it is shorthand for: what kind of sediment did this rock come from. Imagine: What do the rock materials in Parleys Creek, right here at Sugar House Park look like? How do they differ from what we saw at the mouth of Parleys Canyon? What does that tells us about their “environment of deposition”? Now imagine the bedrock at the mouth of Parleys Canyon? What was its “environment of deposition”? Content: Sediments document “environments of deposition” in the present. Sedimentary bedrock documented the environment of deposition of the past. 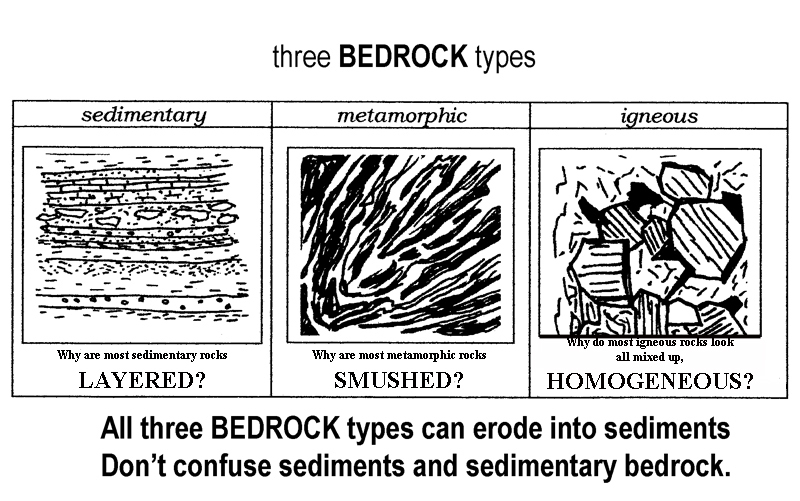 What is the difference between sediment and sedimentary bedrock? By the end of this Osher course, Earth Science Outside. Participants will not be totally confident in their skills to read patterns of rock units or how to put the rock units in order. But participants should recognize how geologists figure out series of rock units such as at the mouth of Parley’s Canyon. Participants should realize that Utah in the past did not look like Utah today. 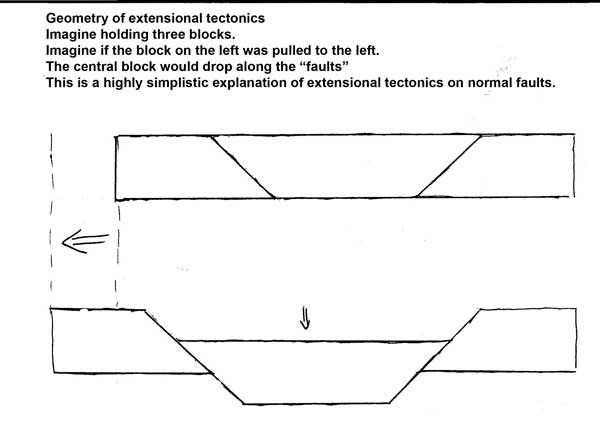 To figure out the history of how the Wasatch Front came to be… don’t forget Tectonics Rules! 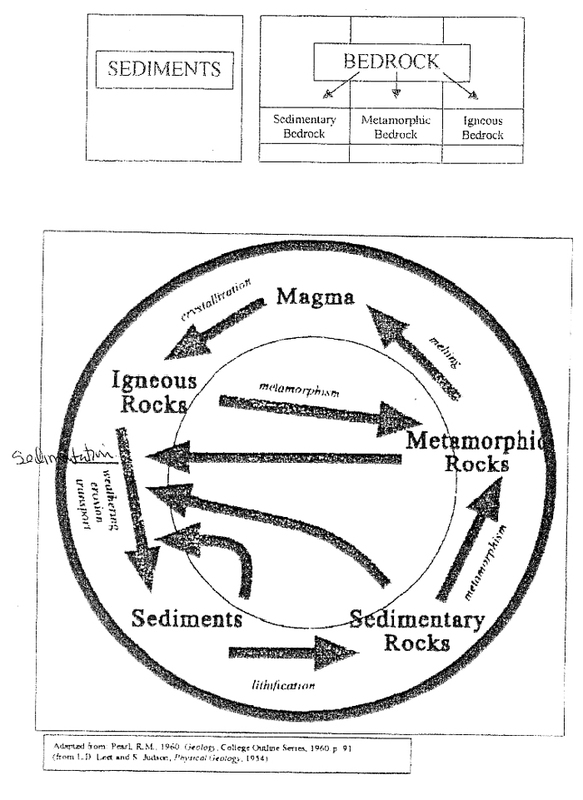 Geologic History of what is now Sugar House Park. Chapter 1: Metamorphic basement. Rocks from this chapter underlie the region, but neither the rocks nor the landforms that we see at Sugar House Park were present during Utah’s Chapter 1. Chapter 2: Metamorphism Lite. This chapter affected the region that would become Sugar House Park. 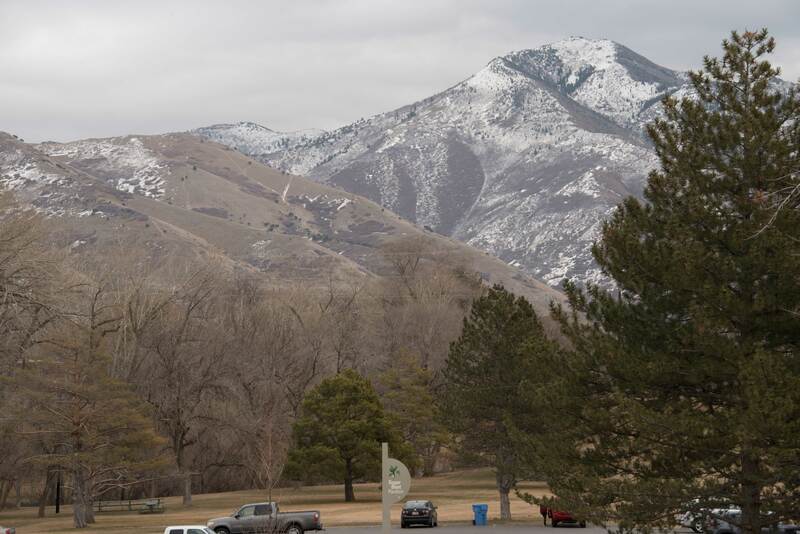 Some of the bedrock we see from Sugar House Park, such as the bedrock of Mount Olympus, existed then but none of the landforms including Mount Olympus that we see today from Sugar House Park were present during Utah’s Chapter 2. Chapter 3: Seas come in and seas go out. This chapter laid down rocks that record a marine (ocean) environment, near sea level, and near the equator. That’s where what-would-become Utah was at the time of trilobites. Some of the bedrock we see from Sugar House Park existed then but none of the landforms that we see today at Sugar House Park were present then. Chapter 4: Broad basins. This chapter laid down uneven thicknesses of rocks that record broad basins perhaps like today’s Gulf of Mexico’s thick sections of sediments. Some of the bedrock we see from Sugar House Park, such as most of the bedrock of the Oquirrh Mountains existed then, but none of the landforms that we see today at Sugar House Park were present then. Chapter 5: Deserts and Dinosaurs. This is the chapter of the rocks that we mapped in Parleys Canyon. It was a time when what-would-become-Utah had environments similar to those of today’s north Africa including those of the shores of the Mediterranean Sea. Environments included mudflats, stream deposits, beach deposits, sand dunes, and sand deposits off shore. This was the time of dinosaurs. These rock units stretch from Wyoming to Arizona. They were deposited here at what-would-become Parleys Canyon and also in what-would-become Utah’s Colorado Plateau. So the rocks of Parleys Canyon existed then, but not the landforms we see today. Chapter 6: Scrunch from the west and swamps in the east. The tilting of the rock units, for example at Parleys Canyon is evidence that Tectonics Rules! Millions of years ago, while the bedrock we now see at Parleys Canyon was buried miles below Earth’s surface compressional tectonics tilted and folded the rock units and raised mountains as impressive as today’s Andes or Himalayas. Thus although the bedrock and their tilting were present during Utah’s Chapter 6, Scrunch and Swamps, the landforms we see today at Sugar House Park were not present. The region looked so different. Chapter 7: Seven up! During this chapter of Utah’s past, the region of western North America rose almost a mile. The terrain may have looked like the Tibetan Plateau looks today. Sediments spread from high regions of Utah toward lower regions of closed basin such as today’s Uinta Basin and as far as today’s southern Nevada. We saw this bedrock from Warm Springs Park. So the rocks were present at depth, but the landforms of Sugar House Park and the mountains we know so well today, were not present yet. Chapter 8: Impressive Igneous. The evidence of this chapter are the granite bedrock of Little and Big Cottonwood Canyons and much of the bedrock of the Bingham Copper Mine. Tectonic forces of Chapter 8 had melted bedrock that became mineral rich bodies. However, the features we from Sugar House Park were not present then. Chapter 9: Now stretching to the west. This is the chapter when the sediments and landforms of Sugar House Park look like they do today. Erosion finally exposed the bedrock of Chapter 5: Deserts and Dinosaurs of Parleys Canyon, the Chapter 7 bedrock we saw at Warm Springs Park, and the bedrock of all the ranges we see from Sugar House. 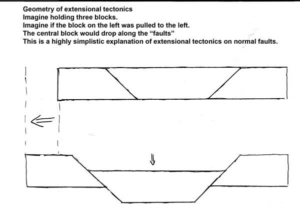 Tectonics Rules! The downdropping of Salt Lake Valley along the Wasatch Fault exposed and continues to expose the bedrock of the Wasatch Front to erosion. Erosion exposes the rocks. Erosion created and continues to create the landforms we see today from Sugar House Park. The sediments that form the surface under the pavilions at Sugar House Park tell, for example, that this place was a delta during Lake Bonneville time, Ice Ages time. when the environment was wetter and colder. Today, the sediments of Parleys Creek at Sugar House Park are not those of a delta but of a stream in a semi-arid environment characterized by flash floods and Sugar House Park is a flood-retention facility. That entire 3 billion-year history, or close to it, is recorded in the materials (bedrock and sediment) and landforms we see today. and then erosion and deposition sculpt the landscape. I hope you’ll never tire of going outside and relishing the Earth science that surrounds us.